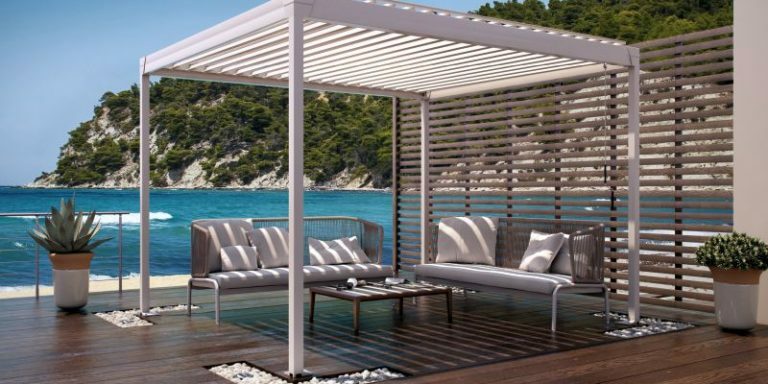 Our range of contemporary louvred patio roofs, patio covers and aluminium pergolas provide a covering that turns your home or commercial terrace into a pleasant outdoor space. With tilting louvres that are easily adjustable by remote control or, in some cases, manually, you can achieve the perfect blend of light and ventilation in no time. This enables you to regulate the temperature according to your needs, giving you a comfortable environment in all seasons. In selected models integrated channels ensure the effective discharge of rainwater, while numerous other options and accessories such as side covering elements, lighting, heating and audio components give you the highest levels of comfort all year round.